There is a recent popular notion, especially among alternative health care providers, that saliva or serum testing or urinary hormone testing can be done to determine hormone management dosing. 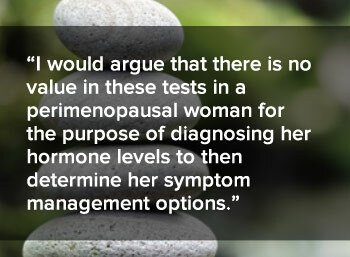 I would argue that there is no value in these tests in a perimenopausal woman for the purpose of diagnosing her hormone levels to then determine her symptom management options. What her levels are on the hour/day/days of the test, is the only information you have gleaned, but this is not diagnostic of perimenopause and is incredibly variable and thus not indicative of her overall hormonal environment and/or treatment needs. Additionally, there is no scientific evidence to my knowledge, to support any claims that there is increased efficacy, enhanced safety or need for the testing in order to determine the dosing of the hormone prescriptions. 8. Interfering components such as food, beverages, medications and chewing gums. Salivary testing of cortisol and DHEA levels holds more promise, as these do not fluctuate so much from day to day, we have a known daily rhythm of cortisol production, and there are naturally higher amounts of these in the saliva, than of the hormones estrogen and progesterone. But even salivary cortisol testing has it’s problems. Cortisol secretion follows a circadian pattern of secretion, with peak values in the morning and a nadir in the late afternoon. Cortisol and ACTH levels rise with increasing age, and serum concentrations at all ages are higher in women than in men. Blunting of the cortisol circadian rhythm is characteristic of aging in both sexes. In the Seattle Midlife Women’s Health Study, during the 7-12 months after the onset of the late menopause transition, (defined as skipped menstrual periods), cortisol levels were reported to rise significantly, coinciding with an increase in DHEAS, urinary metabolites of estrogen and FSH.1 Women with an increase in cortisol were found to have significantly more severe hot flashes; cortisol levels stabillized around the time of FMP.1 Serum cortisol circulates bound to cortisol-binding globulin (CBG). In one study, comparing postmenopasual women receiving oral estrogen therapy, transdermal ET or placebo, total serum cortisol concentrations were 67% higher in those receiving oral ET than in control subjects or women receiving transdermal ET. The increase in total serum cortisol was associated with a higher level of CBG in the women taking oral ET. Salivary cortisol concentration, a measure of free cortisol, was similar in all 3 groups. Serum testing of estrogen, progesterone and testosterone is proven to be more accurate than saliva testing of these hormones, however, I would argue that it is not often that even these are necessary tests in perimenopausal and menopausal women. The reference ranges are often wide, and with testosterone in particular, we are not even sure what is a normal reference range of testosterone for women. In addition, women produce so little testosterone, that it is difficult for the laboratory methods to detect these very low amounts with a high degree of accuracy. Again, in a perimenopausal woman, estrogen levels in particular are flucuating from day to day and therefore is not a reliable tool in diagnosis or management. In a postmenopausal woman, her estrogen and progesterone levels are predictably low--- they are supposed to be. Therefore I would argue what is the purpose of determining low levels when in fact the normal state is that they are low. Hormone testing while someone is on hormones has some rare usefulness in cases that are not going well and it is unclear as to why they are not going well. Other than the occasional serum estradiol test or serum testosterone test, there is need for hormone testing for hormone management because there is no known relationship between a particular dose and delivery of hormones and a specific result on a test. Women with a uterus who are on estrogen need very established doses and deliveries of progesterone or progestins in order to provide endometrial protection from the estrogen. Thus, there is no need for progesterone testing for hormone management. I would assert that we should be increasing our vigilance in evaluation and testing with midlife women for cardiovascular health, glucose stability, and metabolic health vs placing emphasis on diagnosing hormone levels. We can make a dramatic difference in quality of life with comprehensive evaluation including laboratory testing and then optimize our prevention strategies and interventions based on these results with ongoing monitoring of progress. 1 Seattle Midlife Women’s Health Study, 2006. Web.June 2014.